Samantha McPadden graduated from UNC Charlotte in 2015 with a Bachelor of Architecture and a minor in art history. She works at Fleetwood Fernandez Architects in Los Angeles. Eddie Winn graduated from UNC Charlotte with his Bachelor of Architecture in 2014 and works at Montalba Architects in Los Angeles. 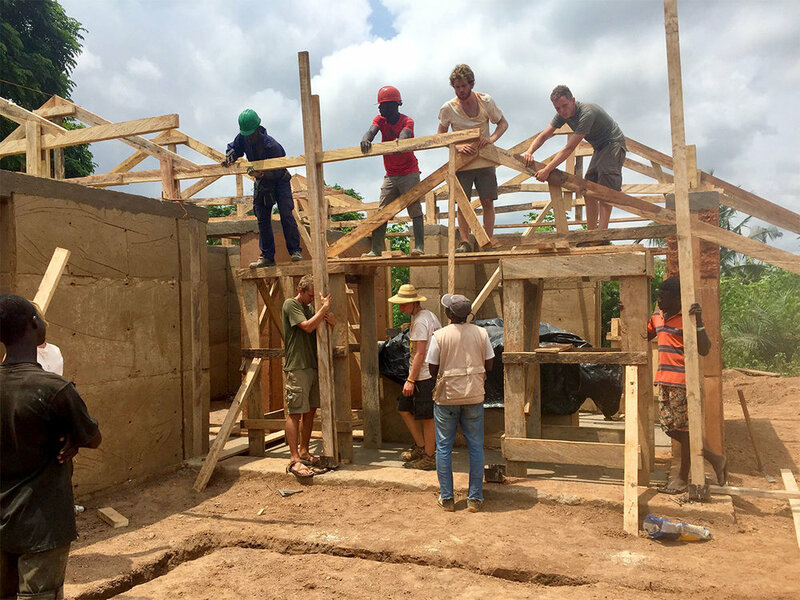 In the summer of 2017 they led a 17-member team, including four additional UNC Charlotte alumni and three current students, in a design-build project in Ghana. 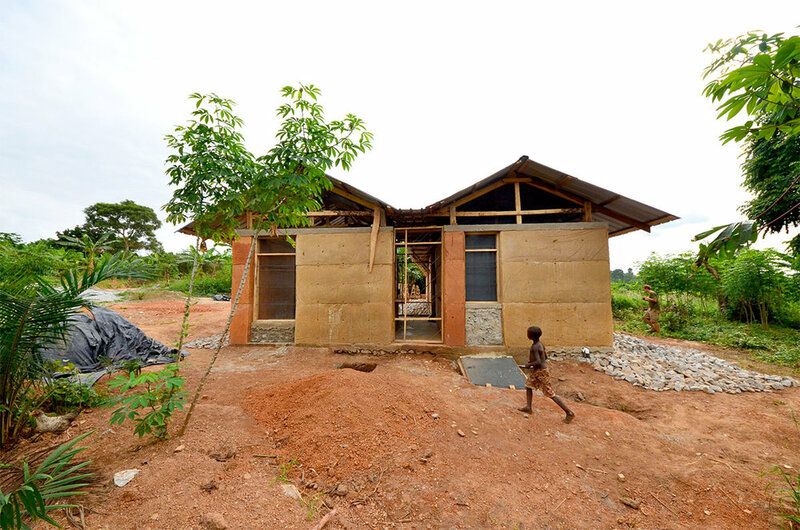 The results were a cast earth medical clinic for a small African village, and a new world view for Sam and Eddie. In September 2015, between working and looking for jobs, we entered a competition with the goal of developing our design skills and working as a team on something. 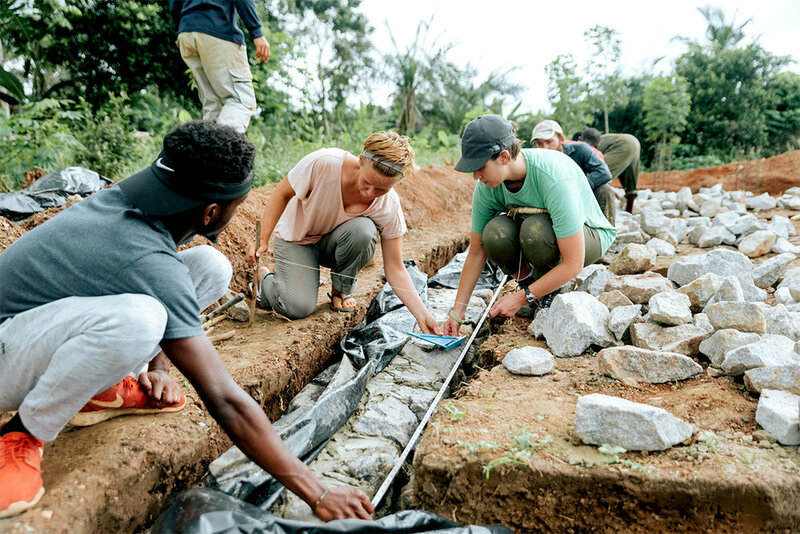 A small NGO named the Nka Foundation was hosting a competition for an earth construction artist-in-residence unit in Ghana. The Nka Foundation’s primary goal is to enhance and develop underserved rural communities through the arts. We got news in November that we had placed and had the opportunity to build our design. For recent college graduates, fairly new to the professional setting of an architecture office, this opportunity was huge. The location was a village named Abetenim, located in the Ashanti region in Ghana. Construction workshops had been taking place in the village for years. 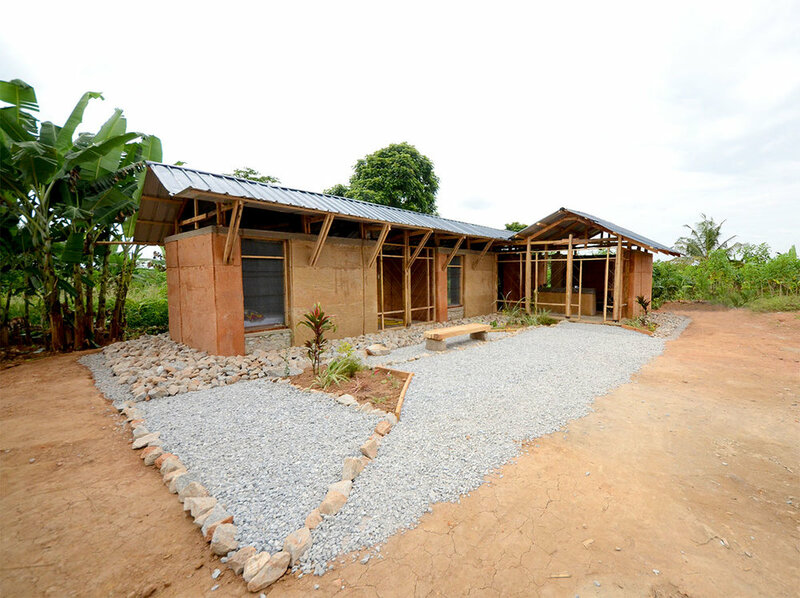 Project goals included developing the local economy and benefiting the children who lived in the village. 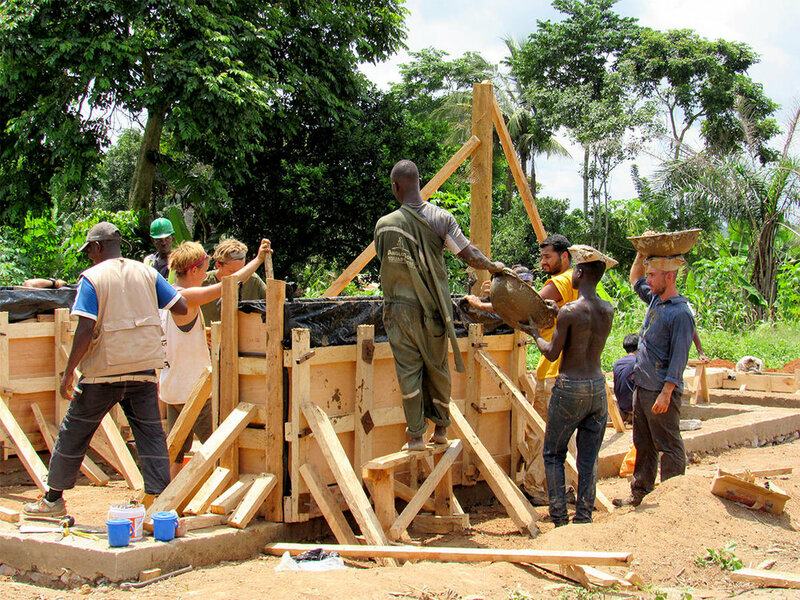 As a very small NGO, the Nka Foundation was only able to provide a site, a connection to the village, and a network of resources, including current and past project teams. We were solely responsible for assembling our team of volunteers, raising the entire budget, and designing and building the project. We started preparing for the unknown. Neither of us had ever managed a project like this before and only had a small amount of construction experience. 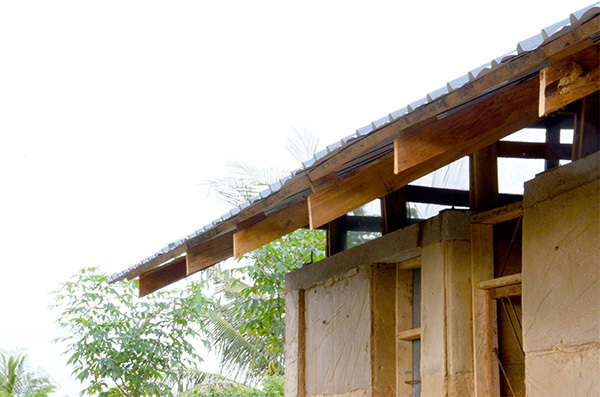 We contacted people around the world who had completed projects in the village before. Past professors provided us insight on managing study abroad programs, as we would eventually share the project with international universities, in hopes of getting student volunteers. 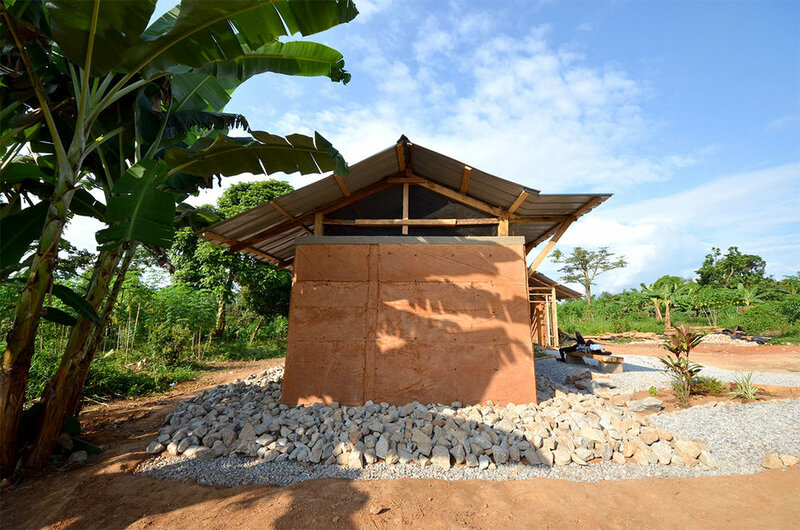 We were put in touch with a local resident of the village who acted as our community coordinator: Frank Appiah Kubi, headmaster of Abetenim’s Elementary School. Frank helps volunteers arrive safely, coordinates accommodations, and helps with anything else he can. Although we were worlds apart and had not even met in person yet, Frank gave us his full attention and efforts. 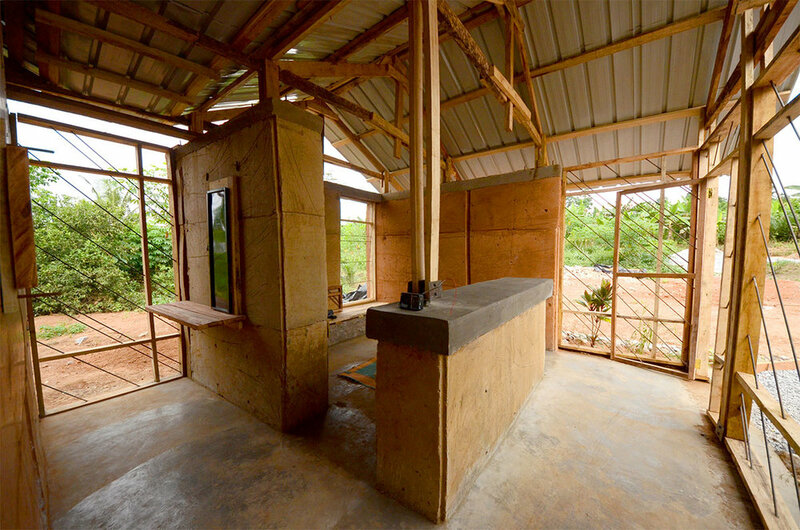 A few months before the trip, we had a solid group of volunteers and enough money to build the building. We bought a suitcase full of sunscreen, bug spray, and baby wipes and started learning a little bit of Twi, the local language. Both of us were lucky enough to be working for architecture practices that encouraged us on our journey and ensured us they would have us back after the project. The first six of us landed in Accra, Ghana, on June 1, 2017. Accra was like no place we had ever been. We walked through a nearby market where, initially, everything seemed chaotic. It was loud, fast, with new smells and new colors. Streams of people walked at an accelerated pace, some with boxes, pans, or maybe a table balanced on their heads. They were squeezing by each other, dodging cars and motorcycles. The flow of people and vehicles never stuttered. There was an innate choreography to it all. We arrived in Abetenim with white knuckles and nervous smiles; what we thought was crazy driving would eventually become normal. The car dropped us off right at our house. With little information given to us about what living conditions would be, our expectations were surpassed. We were lucky to have all of the amenities we were used to! Outside there were children and volunteers playing soccer. A Ghanaian woman named Okosea would cook our meals for the project duration. Frank gave us a tour of the village with the help of a couple of little kids. There is one main road splitting Abetenim into two sides. There were a few tiny shops with people relaxing outside. Houses were scattered through the landscape with no apparent boundaries, all around 200 square feet. We loved seeing everyone’s days spent outside. Small fires outside for cooking, palm fruit harvesting, kids running around playing with palm sticks with wheels at the end, “driving” through the village. The schools were all in the same area, all built around the village soccer field. Located among the houses was a bar called Akapo’s spot, which would play music for the village to hear on Sundays and random nights, depending on whose birthday it was. The first step was locating a site and testing cast earth ratios. Our cast earth mix used local earth along with other components such as gravel and sand and a minimal amount of cement. We hand mixed using shovels and used head pans to carry the mixture. 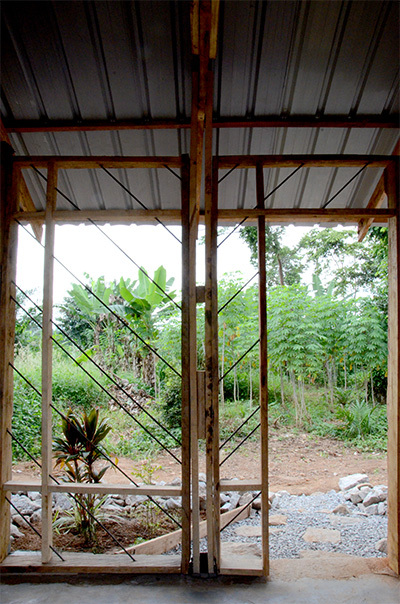 After deciding on our project site, it was cleared by our team using machetes. We plotted the building outline with sticks, string, and a pick-axe. Two weeks into the project, however, we were stopped by the District Chief of Juaben. We heard many rumors as to why, but never a real explanation or reason explaining it. After more than a week of precious lost time, Frank told us about a new plan. A nearby village named Yeboahkrom was interested in meeting our group and potentially having us move our project there. The first step was to visit the village and meet the Chief. The Chief and the village elders were excited to learn about the earth construction workshop. After discussion, the elders requested a clinic, as opposed to our original artist-in-residence building. There was much to consider before redesigning and relocating our project. For one, we would need to redesign completely, due to the change in its purpose. And Yeboahkrom had no running water or electricity and was an hour away from Abetenim. We were worried that the guys we hired from Abetenim would not want to come to the new village to work. But if we stayed with our current project, we may not be able to start the project again. So our group put behind our fears and decided the best option would be to move our project to the new village, Yeboahkrom. 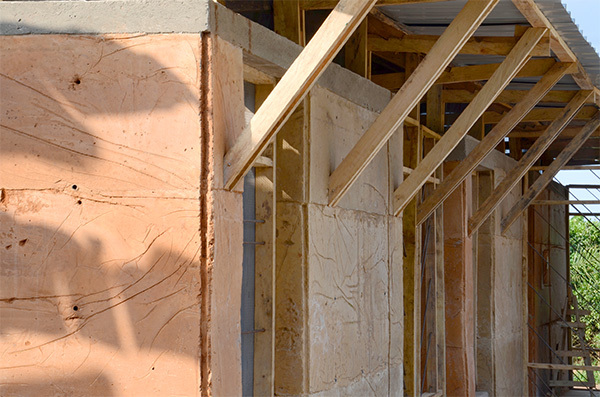 The construction process needed to be accelerated and efficient. 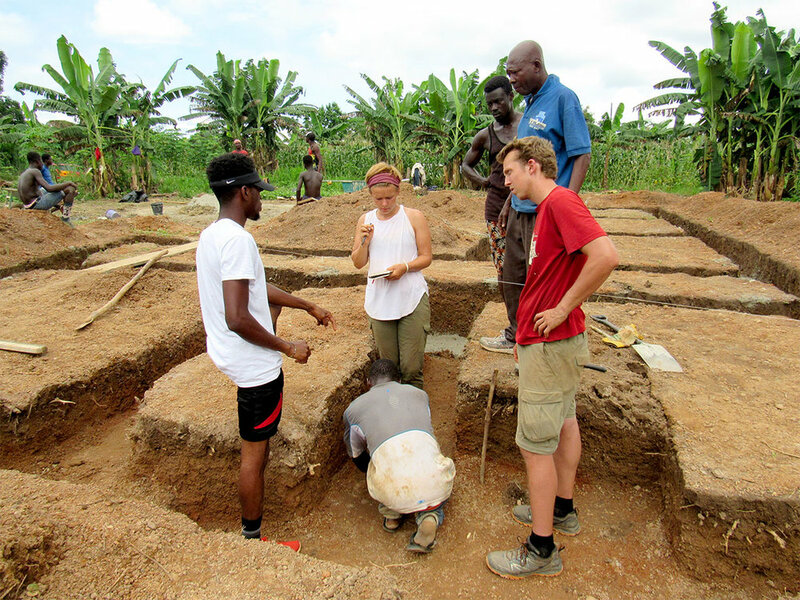 In the field, the project and timeline would rely on flexibility, agility, foresight, long hours, brute strength, and endurance (the latter two mostly exhibited by our Ghanaian friends). We spent approximately three to four weeks working on the foundations. We plotted the building just as we had before, tracing the string lines with our pick-axes and trenching the building’s foundation. One person would swing the pick-axe a few times then step aside. Another person would shovel out the freshly-picked earth...repeat. The next step was to lay our stones. Abu, the mason, was very meticulous with his stone arrangement. Off to the side of the site, we had a large pile of stones. Stones would be carried to Abu to be placed in the trench. We would follow behind Abu, applying hand-mixed mortar to his precisely placed stones, layer by layer. 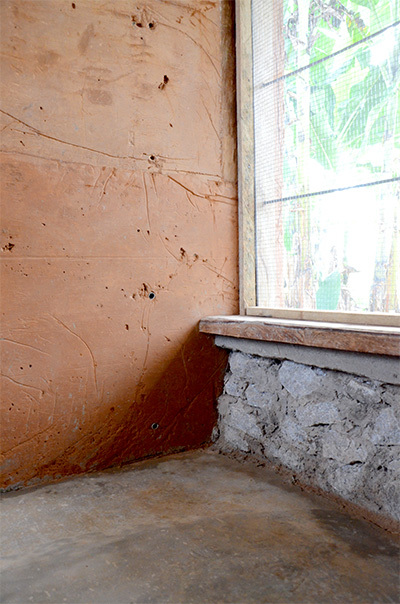 Once the foundation was done, the next big step was casting the earth walls. This earth mix was carried in pans, overhead, to Abu out in the field. Abu would pour the mixture into the formwork. Pan by pan, we filled the formwork. This phase of the project took the longest, at approximately six weeks. The last couple weeks we put up the roof trusses and roof panels and installed windows, doors, and screens. On Sundays, we would travel to nearby towns for the markets and shops. There were beautiful fabric shops where many of us would buy amazing, patterned fabrics. Emanuel, the local tailor, was kept busy by many of us having clothing made. We explored the market, and culture, by trying nearly every new snack we noticed. Our market trips wouldn’t be complete without a trip to the tool store for a refill on nails and tape, or the tiny grocery store for wine and crackers. We would bring home a pile of fruit from vendors throughout the market, which always felt like a treat. We would travel home by tro-tro (mini-bus) or taxi. Various kids from around the village would normally be hanging around our house wanting to play. We played lots of card games, some taught by other volunteers and one by the Ghanaians, which was known nationally. Alumna Ashley Bonawitz with children of Yeboakrom. Alumna Nicole Rivera with children of Yeboakrom. We learned early on in the workshop that it is important to see challenges as opportunities. Many unique opportunities came as a result of our having to relocate and redesign the project. The short time-frame eliminated the luxury of second-guessing. Our lifestyle in Ghana additionally encouraged us to balance firm decisions with flexibility. Each day was different in Ghana. We met four Chiefs and visited one palace. We spent the majority of our days outside and a lot of time without shoes. We learned a (very, very) little bit about Ghana politics and we gave a clinic to a village that needed one. Yeboahkrom residents were very interested in what we were doing and very eager to help. The Chief himself came out and swung the pick axe on a few occasions. Despite the cultural differences, living there was easy; the way of life is enviable. We left Ghana with mixed emotions. We were happy for what we had accomplished and looking forward to a rest. 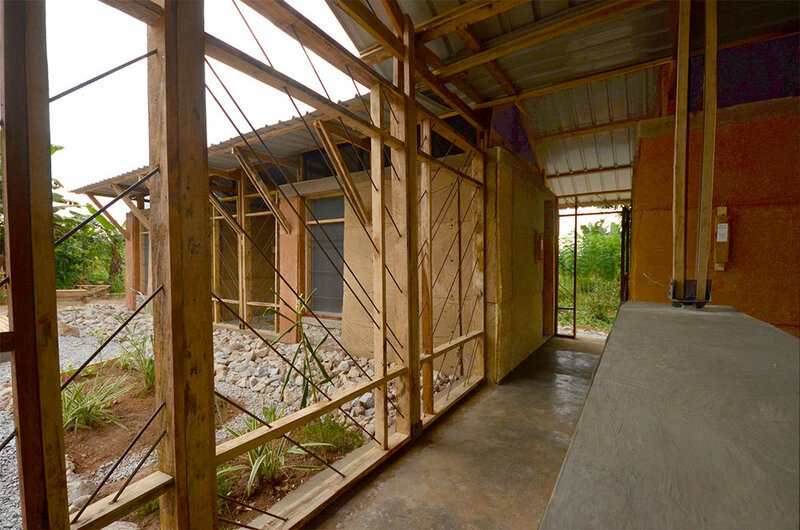 But we were sad to leave the people we had met and anxious to see how the building would work out for the clinic. We are still in touch with many of the people who are living in Ghana and chat with them often over texting. 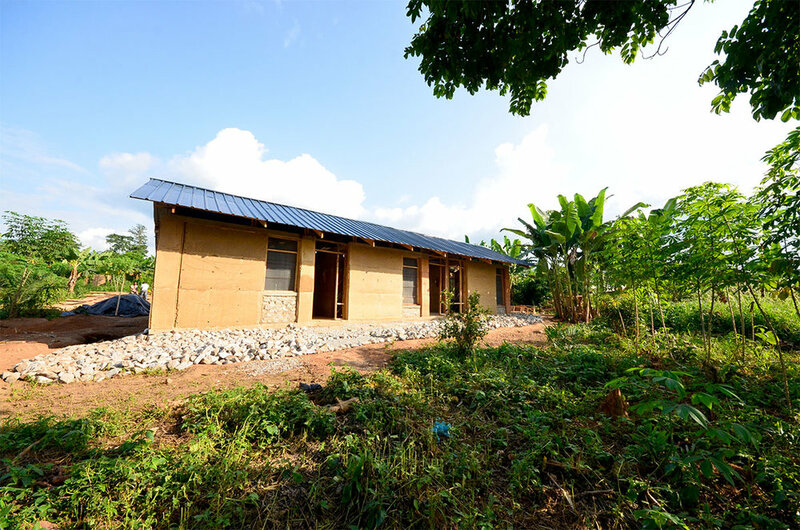 We were excited to hear that midwives were hired for the clinic, because it means that our building is benefiting the women in the community, giving them a safe space for their families.